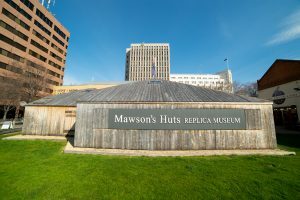 The Mawson' Huts Replica Museum is situated in Hobart on the city's beautiful waterfront, just 50 metres from Constitution Dock and opposite Mawson's Place. Have you ever wondered what it’s like to live among the icebergs and penguins at a -40ºC? Do you want to know what day-to-day life is like at the South Pole? Here’s your chance to meet the scientists, explorers, naturalists , business people, and the support staff that make Antarctic exploration and tourism possible. Image thanks for Tourism Tasmania & Kathryn Leahy. Ties in Hobart run deep, and this second biennial festival, initiated by Mawson’s Huts Foundation, celebrates their social, economic, and cultural relations with Antarctica, bringing you face to face with the hundreds of men and women who can answer your burning questions about life on the frozen continent. Tour operators share the ins and outs of travel, while leading scientists and scientific institutions present the latest updates on their Antarctic projects. Don’t miss the open houses at CSIRO (Commonwealth Scientific Industrial Research Organisation), Marine Science Laboratories, and the Institute of Marine and Antarctic Studies (IMAS). Take a self-guided tour aboard one of two authentic icebreaker ships, the Aurora Australis and the Investigator, docked at Princes Wharf. Feast your eyes on stunning photographs in the international photography competition, and let history and stories of adventure come alive as you tour a replica of Mawson’s huts built just as they were in 1912. Finally, take a seat at the Antarctic Film Festival and watch as the beauty and rarity of this mystical and mysterious continent unfold before you, in a refurbished state-of-the-art theatre. This is a global summit to meet the brave and the brains of the Antarctic community, and to honour the relationship of Hobart’s role in the exploration of the continent. Hobart, being a gateway city to the icy continent, boasts huge numbers of Antarctic workers and visitors. Come if you are curious about anything Antarctic. When and Where? How Do I Get There? Hobart and nearby waterfront venues host this biennial event in early August for four days. There are daily flights from Australia’s international airports, or catch the Spirit of Tasmania ferry from Melbourne to Devonport. From Devonport to Hobart it’s a 3.5-hour drive by taxi or car; the bus takes nearly five. Hobart is loaded with exquisite food and drinks. Fish Frenzy is a prime choice for high-quality seafood, Aloft is an excellent choice for dinner with some truly inventive menu items, and Frank Restaurant serves tantalising Argentine fare. And just around the corner from the Mawson’s Huts Replica Museum is Lark Distillery, an obligatory stop for whisky lovers seeking some spirits. Most events at the festival will be free. School groups are free but must be booked in advance. Ship tours cost a nominal fee and must also be booked in advance. A few exhibits may also ask for a small donation for the Mawson’s Huts project in eastern Antarctica. Mawson Huts consisted of magnetograph hut (measuring Earth’s magnetic field), transit hut (Astronomical Observatory), and main hut (workshop, shelter) .